This has been a long, hard week. As well as the usual stuff (including two Bristol days), there have been two hospital visits in one day and a meal out. The fridge-freezer was delivered, and A ordered a bike. I feel exhausted, guess I’ve just overdone it a bit. Last weekend we had a lovely excursion to Barbury Castle, a hill-fort on the Ridgeway. My baby bro met us up there, with his wife and baby Gethin. Although there isn’t anything much there to do, it’s a lovely peaceful place to just stroll around, to sit and eat lunch, to gaze over miles and miles of surrounding countryside. Gethin seemed oblivious – not surprising given he’s only 3 weeks old! Tuesday was the busiest day, starting with working at home until 3pm, then Mum’s appointment at one hospital, then mine at another, finishing with dinner out with Mum and her partner. Mum’s appointment went well, overall. The tests taken the previous week showed no signs of cancerous cells at all, thank heavens. She does still need a minor op, to remove some obstructed milk ducts, but it’ll just be day surgery. That should be towards the end of August. My appointment was also fine. The consultant is happy to continue the treatment I’m on at the moment, but wants to also start me with a Mirena coil at the same time, while I’m well. There are potential issues with Mirena, especially as I’ve never had children, but he thinks I’ve got a better chance of it working if I’m well when it’s fitted. So I also need day surgery in August! After trawling the hospitals for the afternoon, we went on to a local pub in Wroughton, where we’d ended up, and met Mum’s partner for dinner. It saved us all the trauma of cooking when we got home, and it was nice to spend time with Mum. By Friday, I was so tired I could hardly stay awake to work. So we compounded the problem with a take-away and a bottle of wine. I know I shouldn’t eat curry, unless I’ve prepared it myself, and I certainly shouldn’t drink wine, but sometimes I just need to let off steam and I thoroughly enjoyed both. I’m suffering for it today though! This lovely one now has a partner. They are made from Violet Green‘s Stellar sock yarn, which is soooo soft. 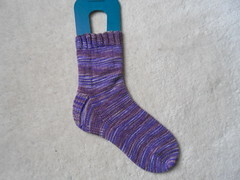 Of course, I immediately cast on a new travel sock, for the train journeys. 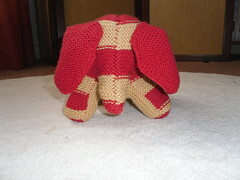 The pattern is ‘Flo the Elephant’ from the current (first Fall) issue of Knitty, and I love it. It was a bit painful with all the sewing up, but that went quicker than I anticipated and the end result is so worth it. 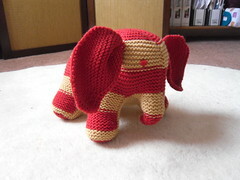 The elephant is a gift for Gethin, and I’d like to name him before handing him over, but I can’t quite think of the right name…any ideas? So, this week…not a lot on I don’t think. I have to organise the next dose of my treatment with the doctor’s surgery. Other than that just work as usual. Hopefully! This entry was posted on July 31, 2010 at 11:10 am and is filed under Baby, Cross-Stitch, Health, knitting, Mum. You can follow any responses to this entry through the RSS 2.0 feed. You can leave a response, or trackback from your own site.